THE last time Raoul Wallenberg was seen alive by his friends and colleagues was on January 17th 1945. He left his safe house in Budapest to meet the commanders of the Red Army, which was besieging the city. Wallenberg and his driver, Vilmos Langfelder, were arrested and then they disappeared into the maw of the Gulag. 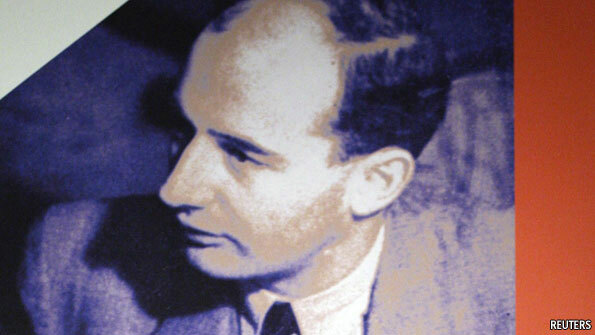 A Swedish diplomat posted to Budapest, Wallenberg saved tens of thousands of Jews during final months of the second world war. He managed this without weapons but armed with a giant bluff. He extended Swedish protection across dozens of apartment blocks throughout the city and issued so-called “safe passes” to their residents. Carl Lutz, a Swiss diplomat, cooked up the idea, but Wallenberg ran with it. The pieces of paper, with their official-looking stamps, soon meant the difference between life and death. According to legend, when Rodion Malinovsky finally liberated Budapest from the Nazis in February 1945 there were so many Swiss and Swedish flags flying that he had to ask someone if he was really in Hungary. Wallenberg lives on here in memory. Most of the buildings and safe houses where he lived and worked are still standing, and it is easy to walk in his steps. The former Hazai Bank on Harmincad street, in the heart of downtown, is now the site of the British embassy and features a fine memorial plaque. The former Red Cross building on Benczúr utca, in the diplomatic quarter, is now the Austrian embassy. The safe houses in the former International Ghetto, on the riverside in District XIII, are now comfortable middle-class homes. Perhaps it’s because we don’t know his fate that Wallenberg remains such a powerful a figure. He almost certainly died in Russia, but we do not know how or where or when. As late as the 1980s there were rumours that former Gulag prisoners had seen or heard of him. Wallenberg has now become an icon of courage, proof that one man can make a difference. What would he think of Jewish life in today’s Budapest? He would probably be cheered because it is thriving, but saddened because so is the far-right. Nowadays most estimates put the size of Hungarian Jewry at around 80,000 to 100,000, making it the third-largest community on mainland Europe, though only around a tenth of its pre-war numbers. The city has all the rudiments of Jewish life, with many working synagogues, Jewish schools, and a kosher butcher and cake shop. The old Jewish quarter—the former site of the main ghetto—is now the hippest part of town, home to plenty of bars, cafes and restaurants. Jewish life is increasingly public, and the city hosts a Jewish Summer Festival and a Chanukah festival every year. Politicians from the governing Fidesz party annually light the Menorah. But as Shlomo Köves, a local Chabad-Lubavitch rabbi, points out, few of these Jews are at all observant. Many Holocaust survivors wanted little to do with the religion; some did not even tell their children that they were Jewish. Only now, two generations later, is a new wave of young Jews speaking openly about their heritage and identity. This is happening at a time when anti-Semitism is on the rise, thanks in large part to the growing strength of Jobbik, the far-right party, says András Kovács, a sociologist at Central European University. Jobbik, the third-largest group in Parliament, denies it is anti-Semitic and says it is only against Israelis trying to buy up the country. Physical attacks against Jews remain extremely rare, but tolerance for anti-Jewish prejudice appears to be growing. Nearly a quarter of Hungarian adults said they found Hungarian Jews “disagreeable” in a recent survey, up from 10-14% in 2006. One far-right website, even more extreme than Jobbik, has nearly 40,000 likes on its Facebook button. Many of its fans are employed and often well-educated—hardly the cliché of the neo-Nazi skinhead. Perhaps a visit to the Wallenberg exhibition would encourage a bit more tolerance.